My friend Howard prepared the following recipe for this month's Chef Spotlight dinner where we highlighted Spanish chefs and cuisine. 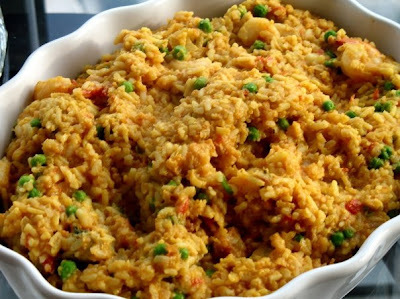 Every Spanish feast should include paella and this recipe was delicious! In a heavy 12-inch saute; pan, heat 1 tablespoon oil over medium-high heat. Cook shrimp until just pink on both sides, 4 to 5 minutes (do not overcook). Transfer to a plate. Add remaining tablespoon oil and sausage to pan; cook over mediumhigh heat until beginning to brown, about 2 minutes. Add onion, and cook, stirring frequently, until translucent, 3 to 4 minutes. Add garlic and rice; cook, stirring to coat, until rice is translucent, 1 to 2 minutes.